To calculate the ramp length, you will first need to measure the vertical rise (in inches) to the threshold – the distance from the ground to the bottom of the door that you are trying to reach. Once you know the vertical rise, you can insert that number into the ADA ramp slope calculator. The ADA ramp slope must be no steeper than 1:12 (1 inch of vertical rise to 12 inches of ramp length.) The Americans with Disabilities Act states that this criteria must be met for any wheelchair ramp that is used by the public. For example, suppose the vertical rise is 10”. 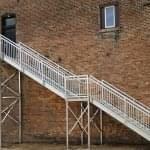 To calculate the ADA-required ramp length, multiply the vertical rise (10”) by 12″. Note: once you calculate the ramp length, it is easiest to round up to the nearest whole foot for planning purposes. Here’s where it can get tricky when calculating the total length of the ramp system. The ADA states that there must be an additional resting platform for every additional 30’ of ramp length. 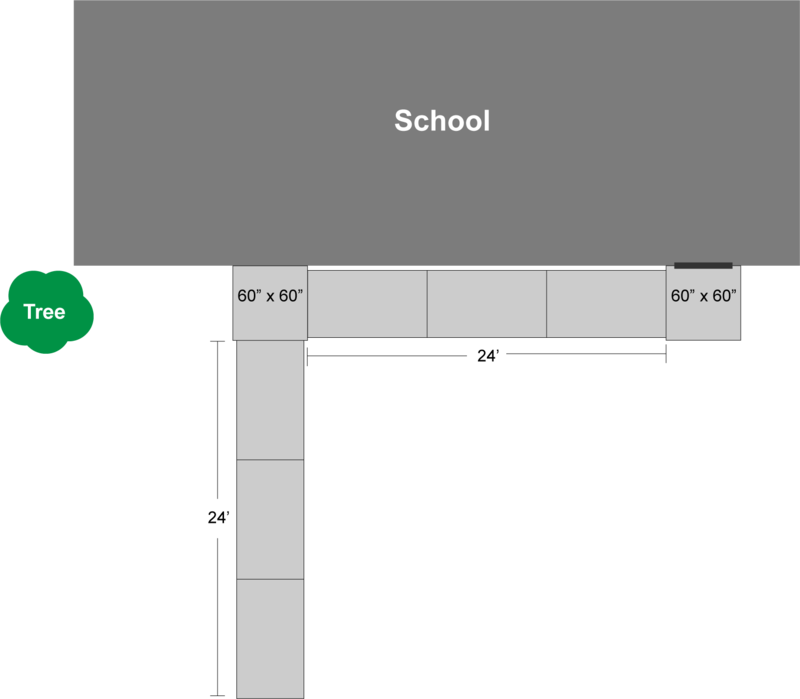 If the ramp changes directions at the platform, the platform is required to be 60″ x 60″. If the ramp is straight, the platform must be at least as wide as the ramp and 60″ long. Once you calculate the required ADA ramp length using the ADA ramp slope equation above, you can refer to the table below to see how many platforms you are required to have. Each additional platform will add 60” to the overall length of the ramp system. To calculate the total space that the ADA ramp will take up, you must add the required platforms and their corresponding lengths to the required ramp length. The ADA also states that there must be a 5′ x 5′ clearing at both the top and bottom of the ramp so that people in wheelchairs have a place to sit. Typically, people don’t need to purchase a platform for the bottom of the ramp because the ramp sits on a sidewalk or parking lot where there is already enough space. If you do not have a platform or space at the top of the ramp, you will need to purchase a platform which will add 60″ to the overall length that the ADA ramp system will occupy. Here is a sample project that we will walk through to calculate the total length of the ADA ramp and platforms. I have a school that needs an ADA-compliant ramp. The door is off the ground, and there is no existing staircase or platform system leading out from the door. The ground is almost flat, but as I move away from the door in the direction that the ramp will go, the ground slopes slightly upwards. I measure the vertical rise from the ground to the bottom of the door, and it equals 49.75″. To calculate the length of the ramp at the required 1:12 ADA ramp slope, I multiply 49.75″ by 12 which equals 597″ (49.75′). After measuring the slope of the ground, I calculate that I only need a 575″ (47.9′) to maintain the 1:12 slope. I will round up to the nearest whole foot (48′) to simplify the calculations. Now I’ll look at the required platforms table above. My ramp falls under the requirements of the second row, so I need to incorporate (1) 60″ x 60″ platform that breaks up the length of the ramp. I also need (1) 60″ x 60″ at the top of the ramp. Determine the ADA ramp layout that will fit your application; if you choose a switchback ramp, you will need at least (1) additional platform. For this example, we will use an L-ramp so that it avoids an existing tree. Below is the ADA ramp layout. 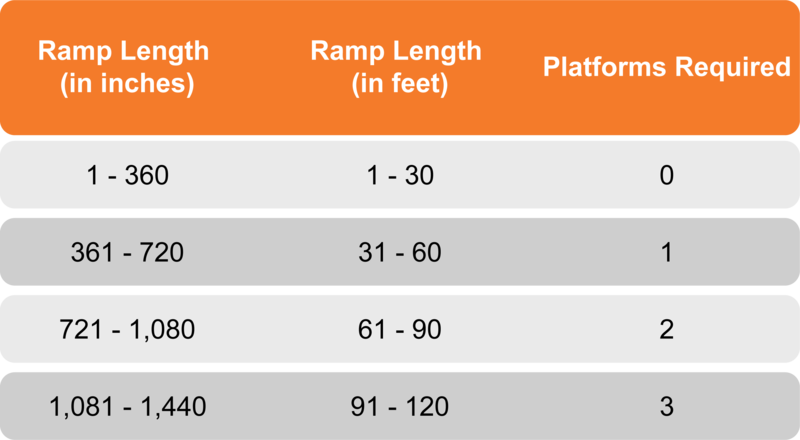 In total, the ramp system is 696″ (58′) long.